(Seaside, Oregon) – The Seaside Aquarium has had an exceptionally crazy 24 hours, with a sea lion, a barn owl, a live shark and a beached whale all grabbing their attention Wednesday and Thursday – as part of their role in the Marine Mammal Stranding Network. The strandings included two exceptionally rare events: a shark that was still alive, but ailing, and a Humpback whale, which has never washed up in this region before. It all began Wednesday afternoon when reports started coming in about the Humpback corpse slowly beginning to roll in on the surf at Klipsan Beach, along the Long Beach peninsula. Seaside Aquarium manager Keith Chandler spoke to BeachConnection.net in the early afternoon, saying they expected it to hit the beach at any time. The body beached around 3:30 p.m., and aquarium staff got there around 5:30 to photograph it. They later turned over the study to an organization in Washington, which will conduct a necropsy to determine the cause of death. “It has been dead a while,” Chandler said. Reports from the scene indicate the whale is becoming odorous. Chandler said the Washington group will conduct their necropsy on Friday morning, then bury it deep in the sand. Early on Thursday, reports came in about a living shark that had washed up in Seaside, not far from the Turnaround. Chandler said the blue shark (Prionace glauca) had been lying in the air for about a half hour, and was near death. The crew from the aquarium took the five-foot-long shark to a small wading tank, where they tried to restore it to better health. “A shark lying on the beach is not a good thing,” Chandler said. “And one that’s been out of the water for a half hour is even worse. It had some markings on it that look like it was caught in a net, so we think that’s what injured it and made it wash up with the tide. The shark lived for a few hours, but died around 4 p.m. on Thursday. It will be given to the local high school for dissection. On top of all this, the aquarium had to deal with an injured barn owl Thursday. It was brought in by a motorist who found it near Cannon Beach. Chandler said it had likely been hit by a car. Staff took it to the Wildlife Rehabilitation Center for the North Coast, just a ways east of Astoria. When it comes to whales, Boothe said this event was an unusual one. “In the ten years that the Seaside Aquarium has been active in the Marine Mammal Stranding Network, this is the first Humpback whale to wash ashore in our area,” she said. “Humpbacks are in all oceans form the poles to the tropics. Northern Pacific Humpbacks such as the one that washed up here feed in the cooler waters of Bering and Chukchi Seas in the summer and migrate to Hawaii, Mexico and even Japan to breed. 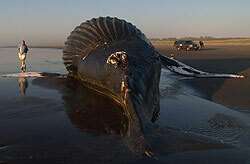 In the winter, Humpbacks of Washington, Oregon, and California migrate to the warmer waters of Mexico to give birth. “They can reach sizes of about 50 feet; the largest recorded Humpback was approximately 64 feet and weighed about 64 tons. The one that washed in was approximately 50 feet. Boothe said that Humpbacks are also known as the “singing whale.” During mating season, males produce an elaborate song that can last up to 20 minutes, changing each year.